This striking log cabin, perched on a ridge, was named for the three small springs where the property meets National Forest Service land. 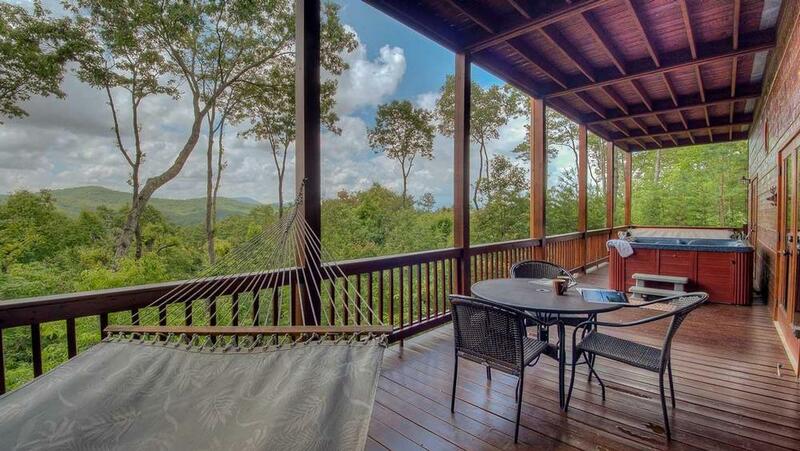 Sitting on former Cherokee land, Three Springs Lodge offers majestic mountain views from each of its three levels, and spectacular sunsets as the sun's rays peek through the trees. 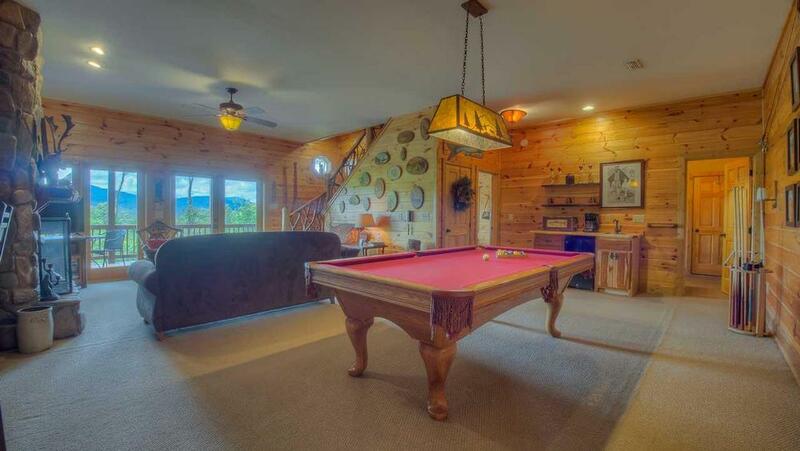 Step inside and experience a beautiful, authentic mountain lodge, with hand-hewn logs, pine tongue and groove throughout with cedar accents, mountain laurel stair railings, gorgeous river rock fireplaces on each level, and hickory furniture. This professionally decorated cabin features custom high-end furnishings, with many details crafted by local artisans, as well as original and limited edition artwork and heirloom antiques. Invite friends here for a luxurious escape, with every amenity at your fingertips. From a waffle maker to an espresso frother, the gourmet kitchen has everything you'll need to entertain. Host a special dinner celebration out on the deck. Or simply bring your favorite crockpot recipe and dinner will be ready when you are. 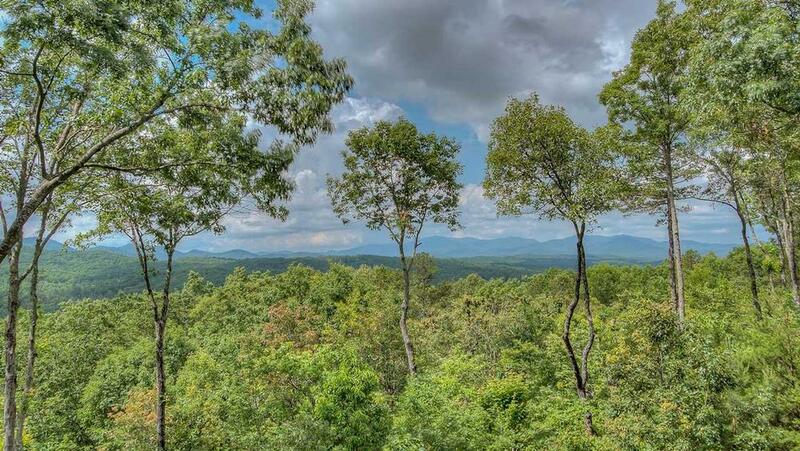 While enjoying a private, secluded spot at the end of a road, you're only minutes from the highway and situated conveniently between Blue Ridge and Blairsville. Have lunch in one of the cafes in town then check out a local performance or festival. But as much as there is to see and do, you may be tempted to stay put. Fix cocktails at the wet bar downstairs in the game room and play pool or watch a movie. Relax upstairs in the loft, a wonderful space to curl up with a book from the loft's library. 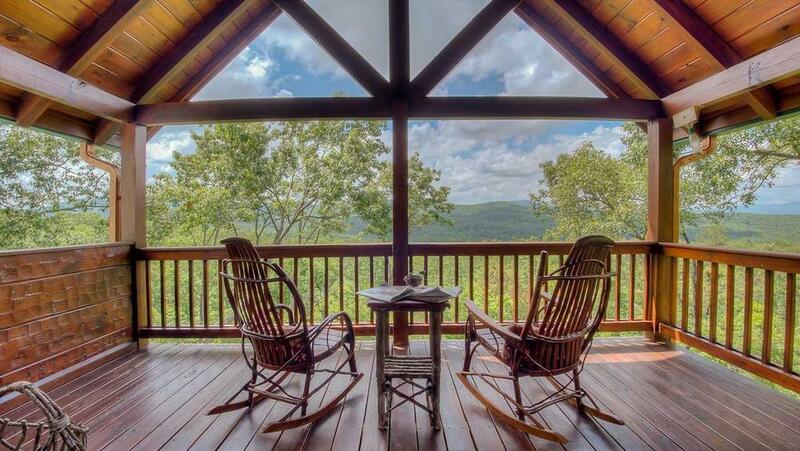 And Three Springs Lodge was made for enjoying the outdoors. Snooze on the hammock or lounge on the deck's rockers or porch swing. Watch animals frolic along the game trail that runs through the property down to the springs — you may spot deer, turkeys or even a bear. Listen as birds serenade you throughout the day as you relax on the Cypress settees around the outdoor fireplace. Indulge in a late-night dip in the hot tub. Then, three king bedroom suites with hickory log beds, pillow top mattresses and luxury linens draped in patchwork quilts promise you a blissful night's sleep. Each suite sits on a different floor, with its own living area and breathtaking views, allowing three couples to vacation together yet still enjoy some privacy. 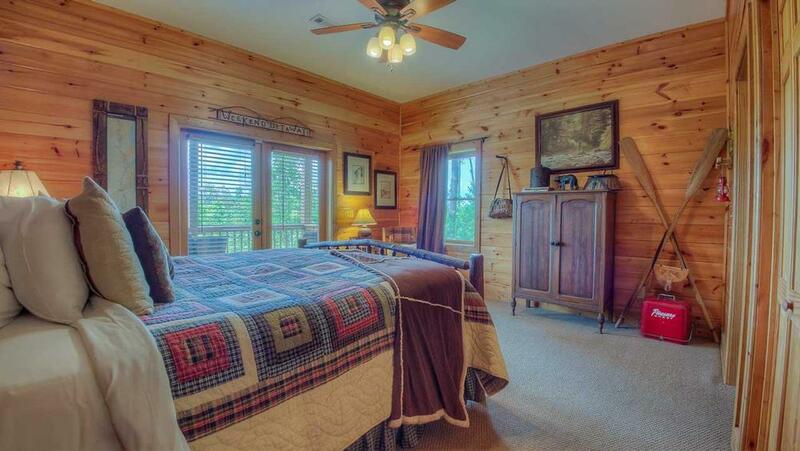 In the bedroom upstairs, snuggle in front of the river rock electric fireplace with a glass of champagne. In the morning, step out on to your private, treetop balcony with a coffee as the blue mist drifts in across the valley below. The coffee/wet bar and mini fridge in the living area downstairs is great for early risers. Guests return to Three Springs Lodge year after year for its warm, inviting atmosphere. Once you experience a few luxurious, rejuvenating days here, you'll be in on the secret. 01/19 - Loved the view and the detail inside the cabin. Excellent company. 01/19 - We have stayed in a dozen or so cabins in the area and this one had the best view. Have truly been impressed each and every time we have used Escape to Blue Ridge. 11/18 - The cleanliness and beautiful decor really caught our attention! Four of us friends rented this cabin for our 50th birthday celebration to relax and enjoy, and this cabin was perfectly accommodating. 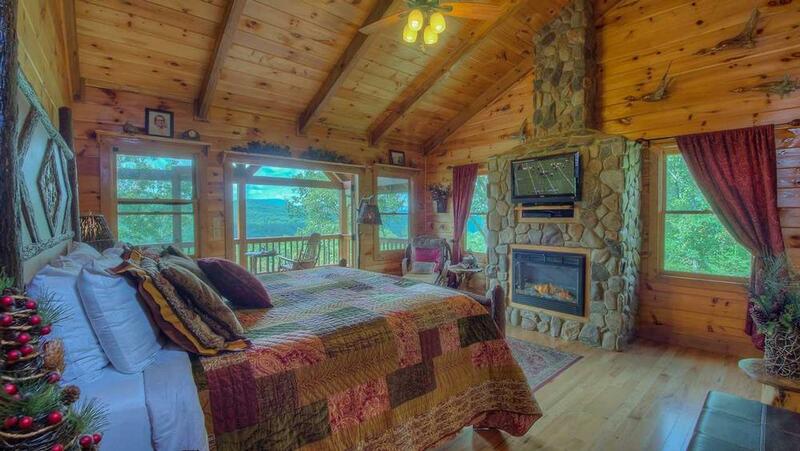 Great cabin and spectacular views. Everyone was great. 11/18 - Enjoyed the decor, privacy and the location. EBR is a first class company. Quick to respond to our needs and a real pleasure to deal with. 10/18 - Beautiful home with breathtaking mountain view. Excellent! 10/18 - The house was perfectly described. Luxurious and decorated beautifully. Enjoyed sitting on the porch looking at the outstanding view. Awesome sunsets at this cabin! Outstanding customer service and social media contact. 10/18 - We felt welcome when we opened the door. The service was immediate and helpful. Any problems we had were taken care of. Will recommend your company to all friends and family and coworkers. 10/18 - House layout was fantastic. Fantastic Company! We love the service we receive! 09/18 - Plenty of room, great scenery. Company is A-1. 09/18 - Great location and the privacy that we have been looking for. Home was decorated beautifully and you could tell was done with great detail. Beds were comfortable and the bedding was high quality. Great company to work with. Also available to answer any questions we had. Will be booking again for next years visit to the area. 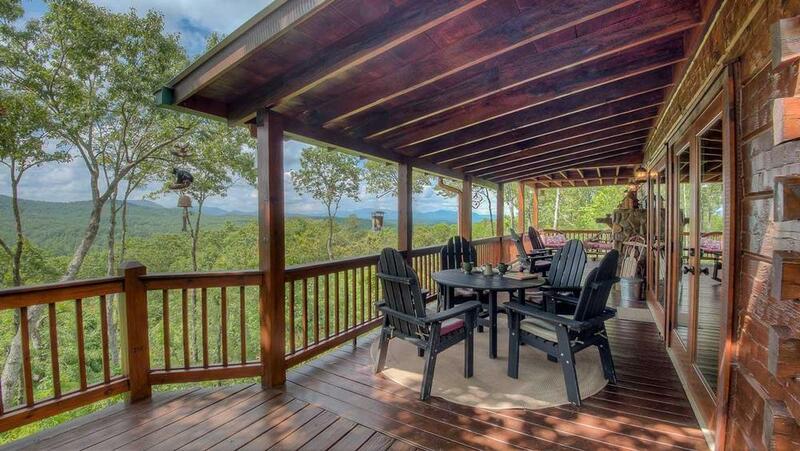 07/18 - The home is beautiful, the views are amazing and it was very centrally located. Love the company, everyone was amazing and very helpful. Definitely coming back for the holidays. 06/18 - We enjoyed the family feel of the cabin. 06/18 - The home was amazing and perfectly decorated. It was classy and had all of the necessary elements to make staying here practical and comfortable. We were very impressed. Everyone was very courteous and helpful. Highly recommend your company and have been singing your praises to my friends. 4/18 - Beautiful view! The cabin was beautifully decorated and very spacious. The beds were comfortable and the view from the upstairs bedroom was absolutely wonderful! We enjoyed the fireplaces in almost every room, pool table, and hot tub. 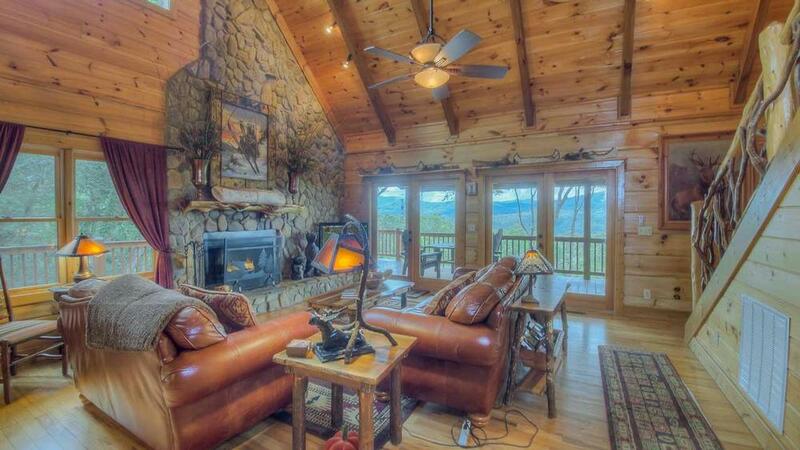 Enjoyed the wood burning fireplace in the great room and the hot tub. 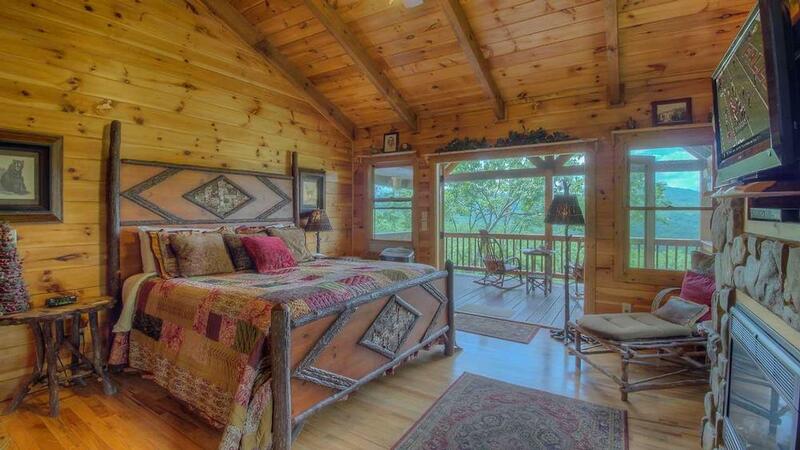 Great quality and value vacation cabins. 2/18 - Quiet, clean, accessible, relaxing, homely. Wonderful and kind hearted staff. 2/18 - The layout of the cabin was perfect and having bedrooms on each floor made it possible for each couple to have plenty of privacy. Your company and the website provided enough information to make our stay enjoyable. 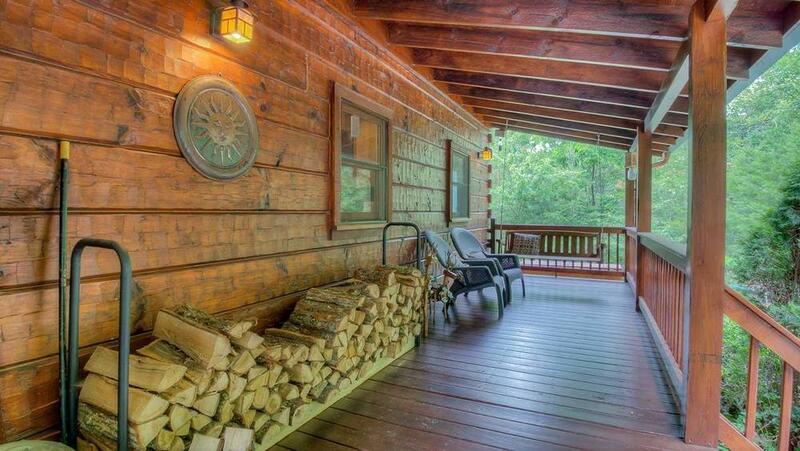 2/18 - We all loved the rustic interior, and enjoyed the quiet area and beautiful view from the porches. Among the reasons we chose this property over the others, were the great dining table setup (seating for 6, with chairs instead of benches), fireplaces, pool table, and 1 king suite on each floor. It was a great retreat for my wife's birthday! The staff were very kind, attentive and helpful. 09/17- Great view, one of the best that we've had during our 15 years of doing cabin trips to Blue Ridge. Very convenient and close to Blue Ridge and shopping and the marina. Very nicely decorated. A lot of space for parking. 09/17- The cabin was very attractive and clean! The scenery was spectacular! All the comforts of home and more. The interior of the cabin was decorated perfectly. My wife and I spent the majority of our time on the deck enjoying the scenery. Very professional! We had no questions that weren't answered! 06/17- Wonderful getaway. The scenic views, fireplaces, peace and quiet were just what we were looking for. Great to work with. Easy and professional. 05/17- Beautifully decorated, updated TV's, fun games, relaxing and peaceful. 05/17- The cabin was fantastic, well maintained and in a private setting. Views from the back porches on each level were beautiful. 3 suites on separate levels for privacy for 3 couples was the reason for this choice. Bedding was nice and comfortable. Well stocked with linens, cookware and appliances and extra amenities. Convenience of gas grill and porch fireplace a plus. Conveniently located with good road access to cabin. Overall, everyone happy with no complaints, a home run! Overall experience was great. Directions to cabin and instructions provided went without a hitch. The limited interaction with staff was pleasant and professional. Nice website to find and explore cabins. 04/17- We enjoyed the peace and quiet. 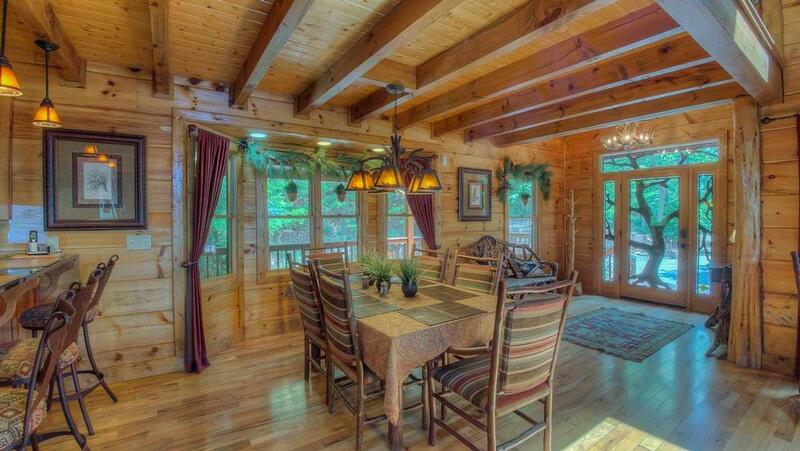 02/17- The cabin was nicely decorated and very spacious for 3 couples. We all really enjoyed just sitting back and relaxing. The home was nicely stocked to get you through the 1st few days. Clean linen and dishes and cookware. The staff was very friendly and professional. Every time I called to ask a question or inquire about something I got a friendly voice to speak to. 12/16- Our favorite features of the home were the three king size beds and each bedroom had a bath. It was a great experience. 09/16- Very spacious, clean, great views and comfortable! Extremely helpful and friendly staff. Julia was very professional we really appreciated her! 07/16- What can I say but it was GREAT. We have stayed at a few other homes with ETBR but this was the BEST. I (we) really enjoyed the walks in the AM and PM. It was like being in a rain forest :-) We also enjoyed the location of both the mountains and the lake. THANKS ETBR. Oh my friends said it was the BEST ever. I would recommend your company to all my friends. 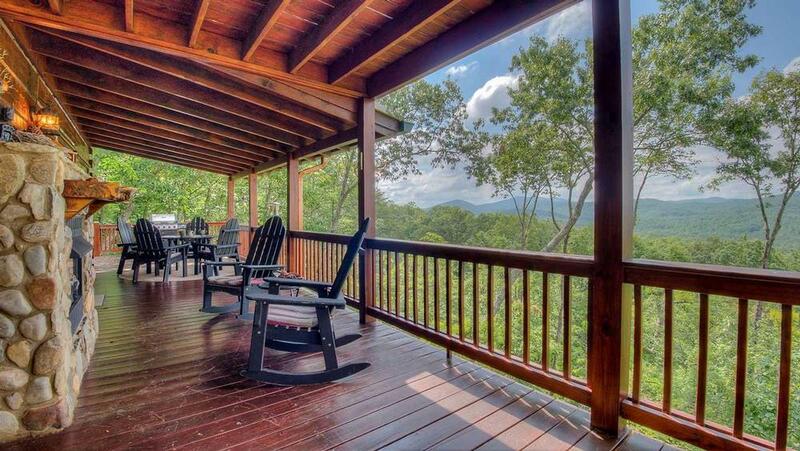 07/16- There are amazing mountain views from the porches and bedrooms! 05/16- The furnishings. 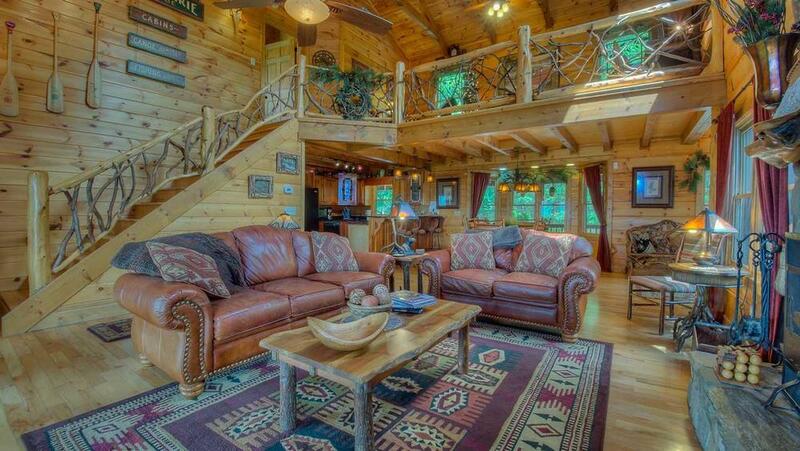 Lots of detail in this cabin. The owner has gone above and beyond on the decor. 05/16- The space, the views and the overall decor were superb. The location was also very convenient. 04/16- Peace, quiet, cleanliness. We felt very much at home. Fully furnished kitchen. Plenty of board games to play. Office accessibility for information. We could go on and on. This is our second trip to Three Springs. Plan to return again and again!!! 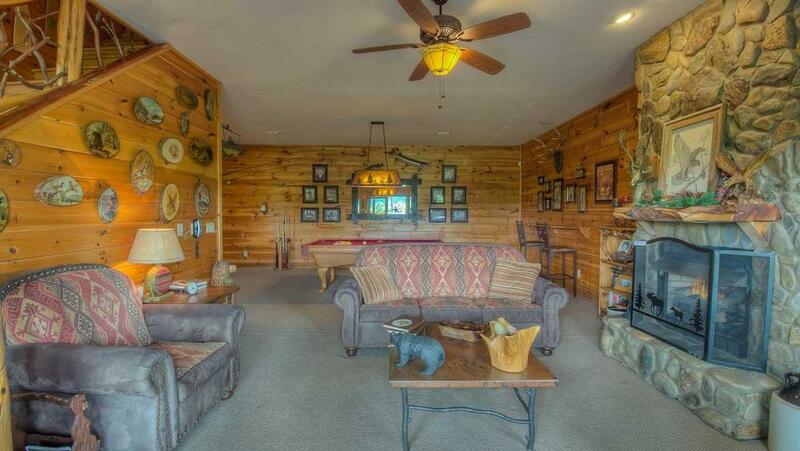 03/16- A rustic feel with modern amenities. 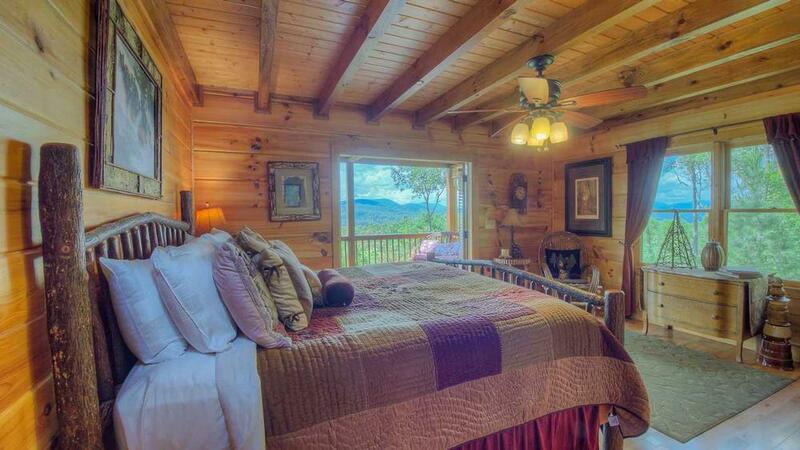 This cabin is large enough to accommodate a family, but intimate enough to host a couple. The layout is beautiful and decor is fantastic. The outdoor space is great and the hot tub was wonderful. Working with Escape to Blue Ridge was a great experience. Everyone was extremely friendly and helpful. The process for booking and arriving was smooth. We will definitely be back! 02/16- The furnishings, view, location, privacy, # of fireplaces and room set-up were very appealing. 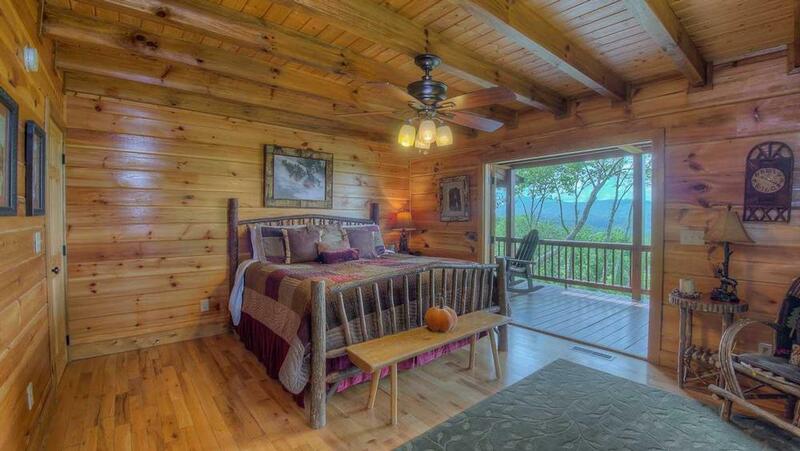 Escape to Blue Ridge is the best cabin rental company we've used - very professional and friendly. And we love the fact that we don't have to stop at a rental office to pick up and return keys! 02/16- Beautiful home with beautiful view. Great company they will help you in any way. 01/16- The mountain views were simply fantastic! We found the cabin to be decorated very tastefully and everything we needed was right there. This is the second time I have rented from Escape to Blueridge and it is always a good experience. 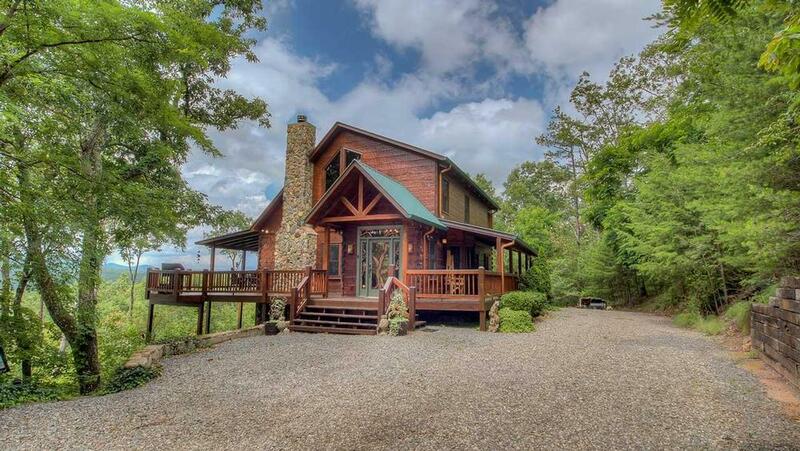 01/16- Very beautiful cabin, private and gorgeous views. The home is decorated so nicely and the beds and rooms are very comfortable. Would absolutely stay here again just perfect in every way! The company is very professional and courteous, they make sure your stay is absolutely perfect! will use them again next time for sure! 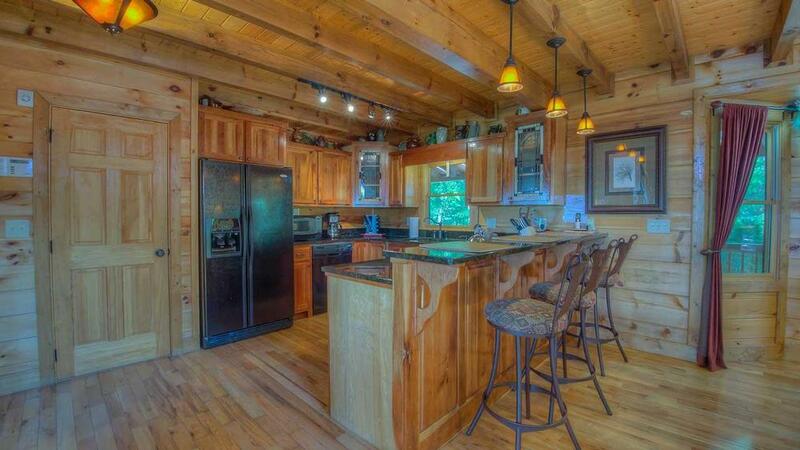 01/16- This cabin is beautifully appointed, every amenity and very spacious. A wonderful retreat for a family or several couples spending time together. your company was extremely easy to deal with, Campbell in reservations made the process a piece of cake. We came to your company after another property mgmt company had cancelled our reservations due to spite. I was trying to book at the very last minute and somewhat upset at the time. Campbell just took over, made everything simple, booked it quickly for me and literally made our whole vacation come true! Thank you, we will be back! 12/15- Absolutely wonderful home. Would recommend to anyone and would love to stay again. Communication emails were great and very thorough and helpful. 01/16- The cabin was beautiful I would definitely stay at this cabin again it really was perfect! 08/15- I love the modern day facilities in a log cabin feel. It is very spacious and has a peacefulness that you can't get in the city. This is the first time that I have stayed with your facility and simply love it. How soon can I book a cabin for July 2016? 02/15- Perfect balance of seclusion. Not too far or too close to neighboring homes! 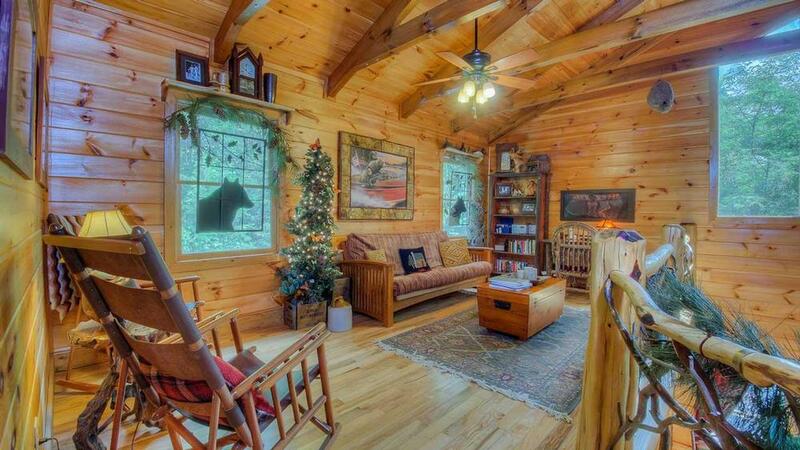 I love the coziness of this cabin. 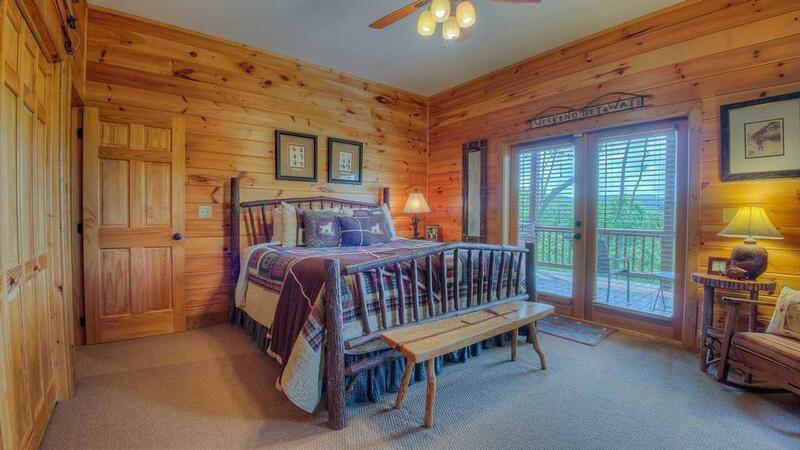 Beds are tremendously comfortable and the 3 King suites perfect for 6 couples! All the porches (there are so many) are delightful, giving you the opportunity to really enjoy nature in many peaceful or fun ways! 12/14- There were so many favorites. 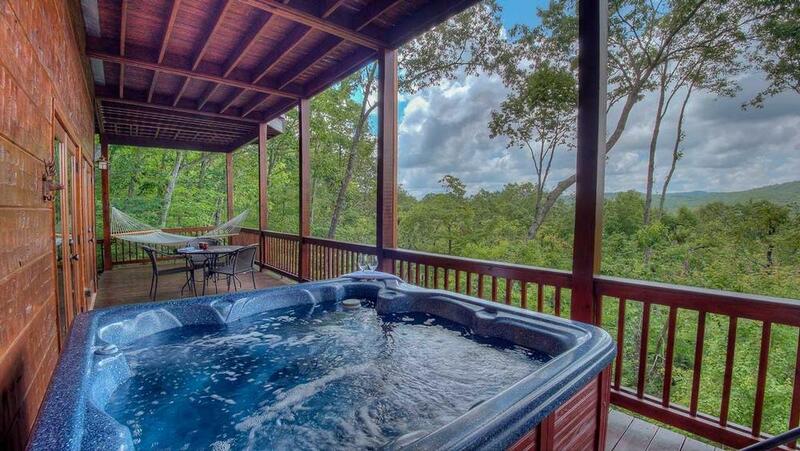 The mountain view from the balcony, hot tub, the master bedroom w/king size bed. I really enjoy staying at Three Springs Lodge and look forward to coming back. 12/14- 3 bedrooms with King size beds were amazing. Overall very satisfied! 12/14- This home had everything I would want to see in a cabin. The decor was amazing. Loved all the Christmas decorations too. 11/14- the decor (very well done), and the privacy of the cabin is perfect too. Very accommodating company. I called the office many times during my visit this time trying to find an even better and larger cabin for my entire family next year and they did everything possible to assist me. 09/14- Loved the views and also the layout of the bedrooms. Ideal for 3 couples. 09/14- The upscale amenities, this home was very comfortable, we felt like we were right at home. 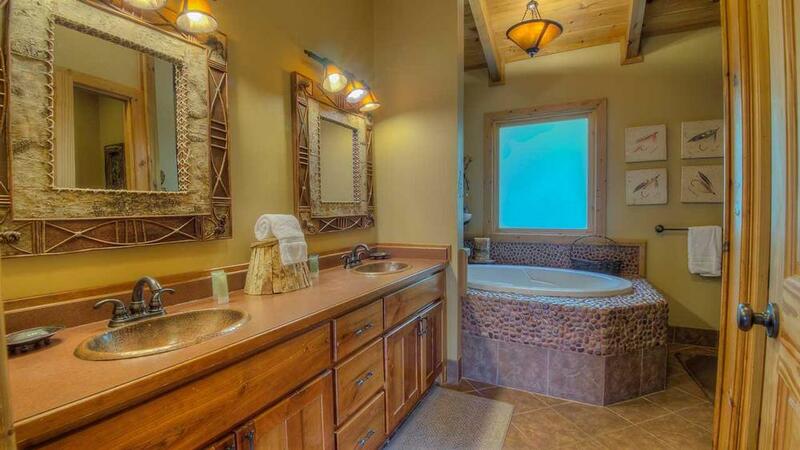 Loved the deep soaker tub in the Master bedroom, as well as the private balcony off the master bedroom. 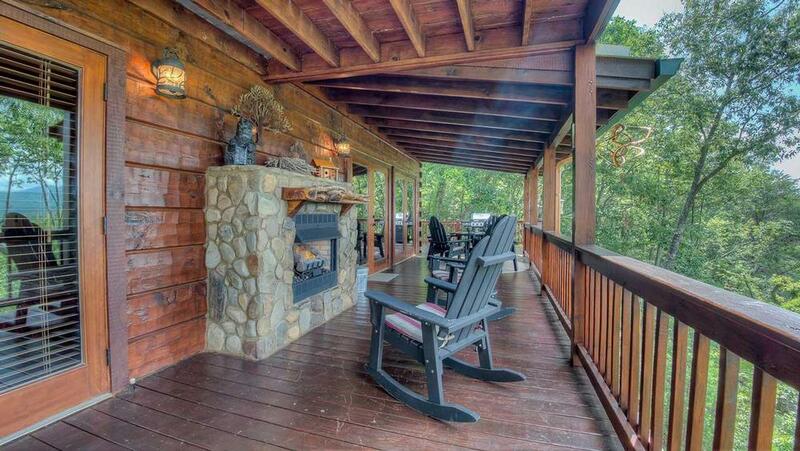 We also liked all the seating areas on the porches/decks, and the hammock was a nice extra as well. 08/14- The appointments were gorgeous! Super kitchen! Someday I'd like to come and just sit on the porches and 'be'. Too much to do in the area. Beautiful! The cabin was beautifully decorated and the views from each floor were amazing! This is our fourth time in the cabin and I wouldn't think of going anywhere else. Walking in the cabin we were blown away by how beautiful everything was. The upstairs bedroom was large with a comfortable bed. Curtains or shades may have made morning easier but helped us get out to enjoy the area. Overall a perfect experience. 04/15- The homey, wholesome, clean, spacious, well appointed, secure, attention to detail, worry-free, sweeping mountain view, everything-one-could- imagine paradise. The fact that three couples stayed in the cabin for multiple days and never got in each others space speakes volumes of this vacation retreat. I really can't speak about booking process because our stay was coordinated by one of the people in our group. However, from my/our personal experience, and comments made by that person (she's a perfectionist 10+), she was as impressed and pleased as anyone. There were no suprises at all! Only one satisfied "customer" comment after another the whole stay.